Quiche is many things — an easy dinner (if you use store-bought pie crust), a light meal, or a way to use up leftovers without too much effort expended. At it’s most basic, it’s just eggs with a little milk or cream whisked in, with any kind of grated cheese you desire. You can add your choice of vegetables, meat or seafood and it will be delicious. It’s also forgiving. There is a nearly infinite variety of quiche in the world, but the mother of all quiches is quiche lorraine. Imagine a savory custard speckled with bits of crispy bacon throughout; sharp cheddar or Gruyère adds a bit of a kick. According to Wikipedia, the origin of quiche lorraine is in the rural Lorraine region of France. The original quiche lorraine had a rustic style: it was cooked in a cast-iron pan and the pastry edges were not crimped. Today, quiche lorraine is served throughout France and has a modern look. The French version is unlike that served in the United States; the bacon is cubed, no onions are added and the custard base is thicker. I will tell you what quiche lorraine is not. It does not contain tomatoes, it does not contain peppers, and it most definitely does not contain scallions. 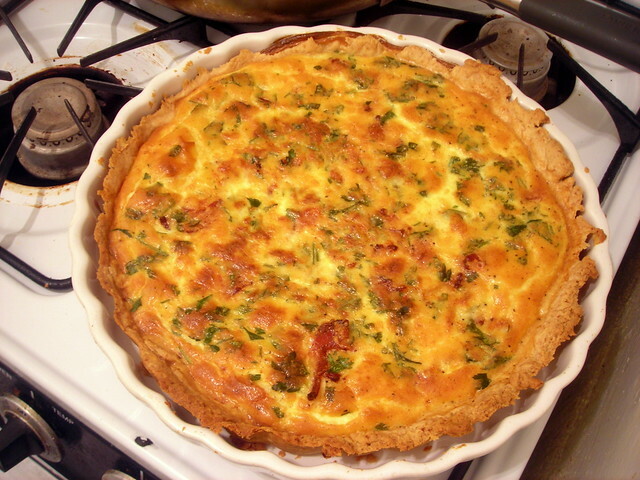 Such a quiche is quiche with vegetables; classic quiche lorraine contains a minimal amount of ingredients: eggs, milk, cream, salt, pepper, and bacon (lardons). Some folks add leeks or onion; ditto for cheese or cayenne pepper. Maybe some finely minced parsley or chives. That’s it. Elise’s version at Simply Recipes adds nutmeg; I like mine without. Deb’s recipe at Smitten Kitchen is a little more complicated with slightly different ingredients, but the flavors come shining through. Quiche: it’s what’s for dinner. Add some mixed lettuces lightly dressed with a Dijon vinaigrette and a glass of white wine, and you’re set. 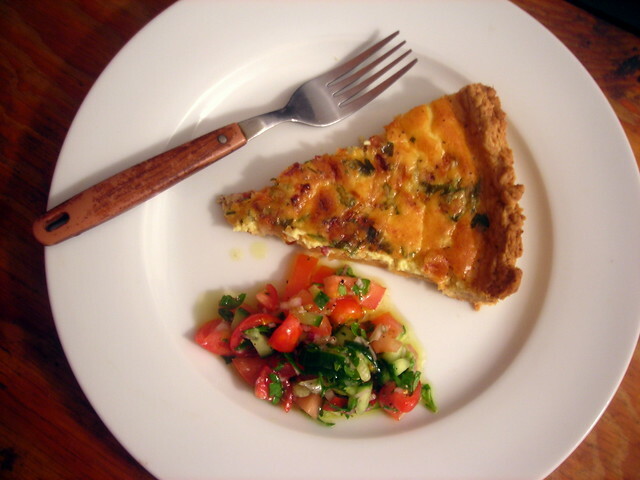 The quiche recipe itself was adapted from Simply Recipes. The version you see above contains a pâte brisée crust — the recipe for which was adapted from “Vegetarian Cooking for Everyone” — but you can use store-bought pie crust and it will be fine. The tomato salad consists of chopped plum tomatoes, chopped seedless cucumber, minced shallots and Italian parsley, and dressed with red wine vinegar, extra-virgin olive oil, sea salt and black pepper. *I like to use beurre d’Isigny for the flavor and the high butterfat content. If you can’t obtain French butter, regular Land O’Lakes is fine. Make sure the butter is unsalted. **The butter should be as cold as possible. You can ensure that the butter is the correct temperature by prepping it beforehand. Cut the butter into cubes, place the butter in a small bowl and freeze it for 2-3 hours or preferably overnight. Stir the flour, salt and sugar together in a bowl, then work in the butter with two knives or your fingers until it makes fine crumbs. Don’t let it become completely smooth, though. Stir in enough water to pull the dough together, but go easy. Too much water will toughen the crust. To line your tart pan, roll the dough out into a 9″ circle, then set it into the pan. Using the heel of your palm, press the dough up the side. If some pieces are too long, break them off and add them, as needed, to areas that are too short. The sides should be about 1/2″ thick, rise 1/4″ above the rim, and be slightly thinner at the base of the pan. This way, when the dough slumps during baking, this shallow space will be filled evenly instead of being overly thick and underbaked. You can freeze the tart shell in advance if you like (for at least half an hour), or make it prior to making the quiche. Tart shells are nearly always prebaked before filling. To prebake (or “blind” bake) a tart shell, preheat the oven to 375 F. Place the (frozen) shell on a sheet pan and bake until set and lightly browned, about 25 minutes. Check it several times for swells and prick any large bubbles with the tip of a knife. Cook the bacon. Heat a large frying pan on medium heat. Arrange strips of bacon in a single layer on the bottom of the pan (you may need to work in batches or do two pans at once). Slowly cook the bacon, turning the strips over occasionally until they are nicely browned and much of the fat has rendered out. Lay the cooked strips of bacon on a paper towel to absorb the excess fat. Pour fat out of the pan into a jar (not down the drain, unless you want to clog the pipes) for future use, or wait until it solidifies and discard in the trash. If you’re like me, having bacon drippings can be a good thing to have on hand sometimes, for skillet cornbread and the like. Chop the cooked bacon crosswise into 1/4-inch to 1/2-inch pieces. Preheat oven to 350 F. Whisk the eggs in a large bowl. Add the sea salt, black pepper and parsley and whisk a little more. Add the milk and cream and whisk vigorously to incorporate and introduce a little air into the mix – this keeps the texture of the quiche light and fluffy. Arrange the bacon and cheese in the bottom of the pie crust. Whisk the egg-milk mixture hard again for a few seconds, then pour it gently into the pie crust. You want the bacon and cheese to be suspended in the mix, so you might need to gently stir it around just a little. You also want the parsley, which will float, to be evenly arranged on top, so move them around with a spoon until you like where they are. Eat at room temperature, cold (a quiche will keep for several days in the fridge), or reheated gently in a 200-degree oven. Time: About 2 1/2 hours (if making the dough from scratch, although this can be done in advance); approx. 90 minutes if using a store-bought pie crust. 08 Aug	This entry was published on August 8, 2013 at 5:25 am. It’s filed under food, food photography, French food, recipe, summer and tagged bacon, dinner, eggs, food photography, French food, quiche, summer. Bookmark the permalink. Follow any comments here with the RSS feed for this post. Well, my Quiche Lorraine comes with delicious Roma tomatoes, beautiful peppers and wonderful green scallions. I didn’t know rudeness was in a quiche. I must have missed that ingredient. Have a great day :)! I wasn’t being rude. I was pointing out that your version of quiche lorraine, as delicious as it might be, isn’t “quiche lorraine” anymore but something else entirely. Names have meaning. The same goes for food. Something to keep in mind, no? After much research, u r correct. What i have been calling quiche lorraine is not a quiche lorraine. I will update the title to Quiche with veggies. I rescind my previous comment about your being rude. Oooh! Do share with Wolfie!! Looks wonderful! I was actually corrected that traditional quiche Lorraine never had cheese! And my mother is from Nancy, in Lorraine! She told me that its true, but she always added cheese anyway. I add cheese. Yours looks beautiful! There is a slight difference between what is traditional and what is authentic. There’s a good discussion regarding those differences here: http://www.theatlantic.com/health/archive/2012/02/in-italian-food-whats-authentic-and-does-it-really-even-matter/253346/ — and although it applies to Italian food, you can imagine it as applicable to any genre of cuisine imaginable. You’re absolutely right. There’s traditional, authentic, and then there’s total snottiness from people who are Italian or whatever who think there is only “one” recipe. My god, there’s not even one actual curry powder recipe within one village! People can really drive me crazy who think they know everything. But then, I also think they’re really rude, because I’m not sure why they care so much. They just like correcting. I’ve become almost defensive on my blog overstating everything so as to prevent obnoxious comments. And, they’re always men. it’s true. don’t know why. If I know anything about food and cooking at my age, it’s that no one can know everything! In any case, great quiche!!! And, that first commenter is the first snotty woman i’ve witnessed! So they must not all be men! Chef Mimi, I was struggling a little bit with your comment as it’s all over the place, but I agree with you about the first commenter as the first snotty woman ever witnessed 🙂 Can’t get snottier than that, can it? She must come off really snotty because of the snotty post created for her benefit. People who think they’re Italian or whatever, still trying to decipher that one. I agree about the people driving you crazy who think they know everything, that one’s annoying. Hmmm, what else? Oh, yes, and how they can come off as being rude, that’s very, very true. Re “people who think they’re Italian or whatever”, I think Mimi was referring to the link I posted, which is a discussion on the difference between “authenticity” and “tradition” with respect to Italian food, and not to anyone in particular. I will touch on a point I made earlier — as bloggers, we have a responsibility to provide accurate information; a lot of the time, we may be perceived to be in a position of authority by our readership. If the information you disseminate (and by “you”, I am not talking about you specifically, mstooks83, but the general “you”) is wrong, that may lead to a loss of confidence, amongst other things. By the way, I want to thank you for commenting in the first place. Even though my post was slightly snotty (*wink*), it generated some discussion and feedback. So, it’s not all bad. Ummm. Not snotty at all. I totally got it.